Trowbridge’s travels through the war-torn South is now brought back to life. After the American Civil War, few Southerners were able to publish books describing their defeated region. And journalists from outside the South were equally fatigued and quite ready to return to familiar surroundings; the thought of visiting and reporting on the war-torn South was not a priority. Fortunately, an author from New England, John Townsend Trowbridge (1827- 1916), was persuaded to undertake the daunting mission of traveling through the unreconstructed South and to compile a journal of his adventures. The results of this intrepid reporter's long-forgotten journey was a sizeable volume that may well be one of our greatest national Iliads. Trowbridge was of literary renown and during his lifetime made acquaintance with many of America's greatest authors, including Ralph Waldo Emerson, Walt Whitman, Oliver Wendell Holmes, Henry Wadsworth Longfellow, and Harriet Beecher Stow. His mission was to talk with members of the struggling society; this included older aristocrats, common citizens, Confederate veterans, freed slaves, traveling vagabonds, and the poorer classes–all profoundly affected by one of America's greatest tragedies. Trowbridge's project would produce an oversized journal containing a wealth of American history. Over the years, there have been few reprints of Trowbridge’s The South and the work has yet to receive the full attention or literary acclaim that it deserves. Furthermore, the volume is quite unusual because the author effectively explores the desolate landscape as well as the mindset of his fellow countrymen immediately after the war; few others have done this. 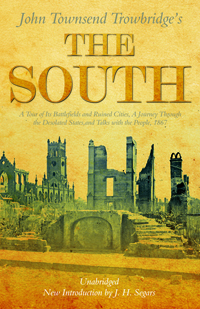 Indeed, The South provides a rare glimpse into Southern life during one of our nation's darkest hours and will appeal to anyone who is in search of a unique Southern and American history.